Automatic carwashes are the best thing since sliced bread when it comes to making life easy. Who wants to spend their Saturday afternoon in the hot sun polishing the Corolla? Some people might be looking forward to summer because at least you want to get splashed by the bucket to cool down – not like in winter. Even so, the carwash can be a more water-efficient – and more fun – option. Before you get in the carwash, get out of the car and check for anything on the car that’s a bit loose and could get knocked off by the force of the machine. Things like mud guards are a good one to watch out for. True story: my Dad was in an automatic carwash the other day and saw one of the buffer rollers get stuck on the car of the guy in front. He watched as the roller eventually jerked upwards … taking the car’s number plate with it. Most automated carwashes give you very specific instructions are what to do before entering the carwash. One of the most important things is to retract your radio antenna and push your side mirrors in against the car. If you don’t take these reasonable precautions and these items do get damaged, the carwash won’t pay for it – and it may not be covered by your car insurance either. Convertibles are an absolute no-go for automatic carwashes. It’s not the fact that the roof might open and let water in, so much as that the force of the rollers or high-pressure jets will damage the weather seals on the roof. Then you’ll let water in no matter whether you’re in the carwash or just driving in a light shower outside. You don’t even need to have kids for this to apply – child-lock the windows as you’re driving into the carwash. It’s just too easy to bump the button for the electric windows and let the soapy water in. You only want a shower for your car, right? If it’s your first time using an automatic carwash, the experience can be a little odd, but don’t freak out. Most carwashes have a conveyor belt that pulls your car through the wash at the correct timing, so you don’t need to do anything once you’re in – nothing to worry about. Many people even find carwashes relaxing if they have nostalgic childhood memories of using them. If you are worried that something has been damaged in the carwash, take a photo on your phone immediately, then speak to the manager of the carwash and point out the damage. Even if they’re not legally liable, they might still give you some freebies as a form of goodwill compensation. 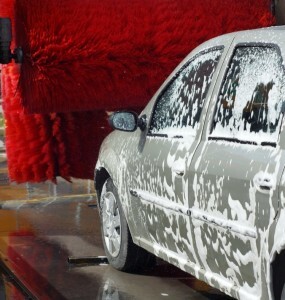 If damage has occurred that wasn’t covered by the carwash itself, you should get in touch with your car insurance provider asap and find out whether you’re covered.